As an independent, non-profit organization, BICC (Internationales Konversionszentrum Bonn—Bonn International Center for Conversion) deals with a wide range of global topics in the field of peace and conflict research centering on Conversion Studies. Our vision is a more peaceful world. Our mission is to conduct critical, problem-oriented, policy relevant research in response to the problems posed by organized violence. To do so, we engage in active exchanges with scholars and politicians as well as stakeholders in everyday practice and civil society. As a think tank, BICC seeks to engage in a dialogue with NGOs, governments, private organizations, research institutes and universities and well as with interested individuals. The talk will give an overview about research themes and projects conducted at BICC. Google has come up with a tablet called “Project Tango” that integrates different sensor technologies by using concepts from robotics and visual perception. The resulting tablet improves its location measurements from the Inertial Measurement Unit (IMU) by correcting them with motion tracking information from its fisheye camera view. Additionally, the tablet’s RGB camera has been enabled to perform depth perception which allows to generate textured 3D indoor models by filming all surfaces that shall be represented in the model. More details about the technology can be found on https://developers.google.com/project-tango/. At the Department of Geoinformatics, we intend to explore a variety of research and development topics with the Developer Tablet including: API programming, Image Analysis/Point-Cloud Analysis, Indoor Navigation, Augmented Reality, Facility Management and other application domains. The talk will present the already identified potential of the technology and will discuss opportunities for involvement in its further exploration. The article Towards a framework for agent-based image analysis of remote-sensing data has been published by the International Journal of Image and Data Fusion in March. 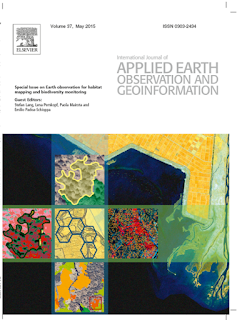 The article introduces a framework for agent-based image analysis (ABIA) of remote sensing data. Robust and transferable object-based solutions for automated image analysis, capable of analysing sets of images or even large image archives, are still rare. Object-based image analysis (OBIA) rule sets bear a high potential of transferability. The high complexity of image content however often makes human interaction necessary. Award for Excellence in Teaching @ Z_GIS | Congratulations! Christoph Traun and Martin Loidl from Z_GIS have received the 'Award for Excellence in Teaching' for their class 'Geo-Communication'. 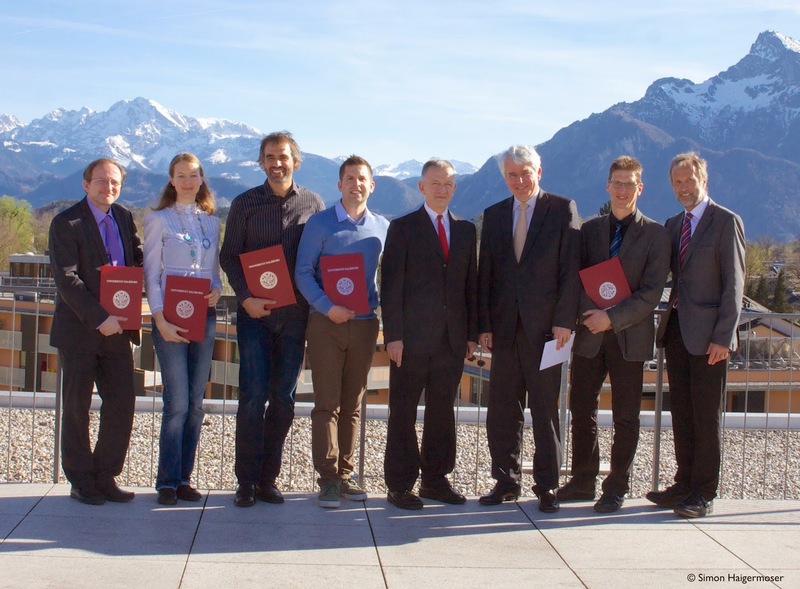 The 'Award for Excellence in Teaching' of the University of Salzburg has been presented to the 4 finalists from the summer semester 2014 and winter semester 2014/15 - with Christoph and Martin taking the top spot with their final presentation. Initial nominations for this award come from students, leading up to an assessment by an expert jury. On April 15, the prize was awarded at the "Day for Teaching 2015". They follow in the footsteps of Z_GIS’ Dirk Tiede, who previously had won this prize for his 'Design and Development of Applications' class. A special issue of Elsevier´s "International Journal of Applied Earth Observation and Geoinformation" provides insights into how Earth Observation (EO) technology supports authorities in monitoring NATURA 2000 habitats. This Special Issue is a joint outcome of the two complementary EU projects MS.MONINA and BIO_SOS. Both projects have prepared the ground for establishing multi-scale services for habitat and biodiversity mapping based on satellite information. MS.MONINA, coordinated by the Department of Geoinformatics - Z_GIS at the University of Salzburg fosters the use of Copernicus space and in-situ data infrastructure for supporting NATURA 2000 monitoring and management. From a multi-scale perspective it provides on-demand geospatial information to users such as local, national and European authorities. The compilation of 17 original papers demonstrates the multi-faceted advantages of EO data in support of biodiversity, ecosystem and habitat monitoring. This is achieved especially with respect to the time and cost effectiveness of the tools. The published papers also show the multi-temporal/multi-scale capabilities for monitoring conservation targets. The journal special issue provides an overview of the state-of-the-art and challenges in remote sensing for mapping natural habitats and their conservation status. From 23-25 March 2015, the Impact of Environmental Changes on Infectious Diseases conference (IECID) took place at the Melia Sitges hotel in Sitges, Spain. The conference covered areas like the impact of current and predicted future environmental changes on infectious disease dynamics in people, wildlife, and livestock across the globe, and what actions need to be taken. At the conference, the EC FP7 project HEALTHY FUTURES sponsored a session entitled “Assessing the health impacts of environmental changes in eastern Africa - spatial modelling tools for integrated risk assessment”, where the project as such as well as some of the main outcomes of the project were presented by the scientific coordinator Prof. David Taylor and further members of the project consortium. The talk of Michael was attended by approximately 150 people and triggered interesting discussions, while the poster presenting the HEALTHY FUTURES Atlas was highlighted as particularly interesting by The Lancet Infectious Diseases (the leading clinical infectious disease journal) on their Twitter account. The Interfaculty Department of Geoinformatics - Z_GIS and the Royal University of Bhutan (RUB) commemorate a decade of academic cooperation by jointly organising a week of Geospatial events in Bhutan. The celebration began with a 3-day Faculty Development Workshop on 'Geospatial Methodology for Assessing Climate Change Adaptation Strategies for Traditional Economy in Bhutan' (GeoM-4-CCAS) at the College of Natural Resources (CNR), Lobeysa on 30th March, 2015 and concluded on 3rd April with the completion of a 2-day Conference and Exhibition 'Climate Change, Environment and Development in Bhutan' (CCED_Bhutan) organised in the RUB Convention Hall at Thimphu. The GeoM-4-CCAS workshop was conducted within the framework of a research project co-funded by the Commission for Development Research (KEF), Austria where 15 participants took 'hands-on' practical training of identifying, processing and analysing various types of GIS and Remote Sensing data related to Climate Change and Traditional Economy of Bhutan, and validated various scenarios of adaptation strategies. The workshop was delivered by a team of 4 experts including Dr. Shahnawaz and Dr. Gudrun Wallentin (both from Z_GIS), Mr. Ugyen Thinley and Ms. Ugyen Yangchen (both from CNR). The CCED_Bhutan Conference and Exhibition was co-funded by the Austrian Development Cooperation (ADC) Coordination office located in Thimphu. The event provided a common platform to about 100 participants from academics, industry and organisations for sharing their Geospatial knowledge and practices as well as for disseminating the outcomes of the GeoM-4-CCAS project. Mr. Dorji Wangchuk (Director General, CNR) delivered the welcome address and the 'Guest of Honour' Ms. Christine A. Jantscher (ADC Resident Coordinator), inaugurated the conference and exhibition. During the concluding session, the dignitaries and participants highly appreciated 26 presentations given over 6 sessions and 23 posters displayed in the exhibition section. Prof. Josef Strobl (Head, Z_GIS) has been leading the cooperation between Z_GIS and RUB since 2005 and Dr. Shahnawaz (Director UNIGIS S/E Asia) is coordinating the activities. The 2 institutions have implemented 2 research projects, 8 Geospatial Faculty Development Workshops and 2 conferences in Bhutan over the last 10 years. Both the institutions have committed to enhance the cooperation and expand the activities further!